The Class of 2017 was honored at the annual Senior Night. KIMBERLY BOSTICK is the daughter of Randy and Cheryl Bostick. Kimberly has participated in Yearbook for 4 years, UIL Academics Accounting and FCCLA. She plans on attending North Central Texas College for an associates, then attend The University of North Texas Majoring in photography. KYLER CARNES is the son of Brian and Gina Carnes. He has participated in Basketball, Regional qualifier in Cross Country multiple times, Regional qualifier in Track multiple times. Kyler plans to join the United States Marines. COLTON CRANE is the son of Gentry and Donna Crane. He has participated in Ag mechanics, Basketball, Cross Country, Track, UIL Academics and yearbook. Colton plans on attending Mid-western University to get a Bachelors of Science in Radiologic Technology, Exercise Physiology and join the United States Reserves. REANNA FORTUNE is the daughter of Eric Fortune. She has participated in Livestock judging, Show team, VP of FFA, J.R.O.T.C. Drill Team, Color Guard Commander, Orienteering, Fire Explorers, French Club, Choir, Swim, Diving, Water Polo, UIL Academics and International Baccalaureate Program. Reanna plans on attending Texas A&M and major in agricultural science and agricultural business all through the United States Navy. WALKER GLADDEN is the son of Mike and Cecilia Gladden. He has participated in Track, Basketball, Cross Country, Student Council, yearbook, FFA, Ag. Mechanics, One Act Play and UIL academics. Walker plans to attend NCTC and then transferring to a University to major in Engineering or considering the United States Military. ERICK GUTIERREZ is the son of Ramon Gutierrez and Elida Verdugo. He has participated in UIL academics, Basketball, Tennis and FFA. Erick plans to go to Weatherford Jr. College for his basics, then go to TWU to major in Dental Hygiene. Ian Lane is the son of Bobby and Claire Lane. He has participated in Beta Club and Yearbook. Ian plans to take College core classes and work. LISBET LICEA is the daughter of Guillermo and Lidia Licea. She has participated in Cross Country, Track, Beta Club and UIL Academics. Lisbet plans to go to NCTC for her basics, then she plans to major in Business. JARED MCINTOSH II is the son of Matt and Beth Vogel. He has participated in Band, Marching Band, Yearbook, Robotics Club, Ski Club and FFA. Jared plans on becoming a commercial Airline Pilot and fly internationally. KEVIN ONEY is the son of Robert and Tracey Oney. His activities include UIL Academics (State qualifier in Current Events and Social Studies) and Robotics. Kevin plans to attend Midwestern State University to major in Geoscience. BROOKLYN RAMBSEL is the daughter of Steve and Kathie Wernimont. She has participated in Basketball, UIL Academics, One Act Play, Tennis, Track, Student Council, Yearbook, livestock judging, Ag. Mechanics, FFA and Explorer program. Brooklyn is planning on attending Weatherford for her basics, then transfer to TWU to become a dental Hygienist. DYLAN RESCHKE is the son of Steven Reschke and Jenny Tribble. His activities include Basketball, livestock judging and FFA. Dylan plans to become a United States Marine. KAYSON ROOF is the daughter of Dusty Roof and Jennifer Lopez. 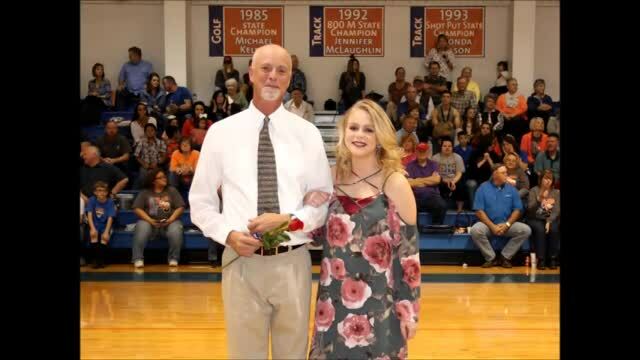 She has participated in Cross Country, Basketball, Tennis, Track, UIL Academics, One-Act Play and senior class vice president. Kayson plans attend Hardin-Simmons University. JACE SCHUMPERT is the son of Chad and Monica Schumpert. He has participated in Basketball, Cross Country, Tennis, Track, UIL Academics, One-Act Play, Ag. Mechanics, FFA and FCS. Jace’s plan is to serve in the United States Air Force. AMBER SYLVERA is the daughter of Chris Sylvera and Monica Schumpert. She has participated in FFA, varsity Basketball, Varsity Tennis, UIL spelling and she is the Senior class President. Amber will attend Weatherford College to get her basics, and then continue on to TWU to get her master’s degree for Occupational Therapy. KAYLER TALAMANTES is the daughter of Brandy Talamantes. She has participated in Basketball, Cross Country, Tennis, Track, UIL Academics and One-Act Play. Kayler’s plan is to attend Weatherford College to major in Nursing. ROSA VERDUGO is the daughter of Elorenco and Velia Verdugo. Her activities include Calculator UIL, Spelling & Vocabulary UIL, Basketball and Tennis. Rosa plans on attending Weatherford College to get her basics, then UNT to major in forensic science and fingerprinting analysis. ADINA ZIDERMANIS is the daughter of Zeke and Rosie Zidermanis. She has participated in Basketball, Varsity Tennis, Track, UIL Academics, Beta Club President and FCCLA. Adina will attend Weatherford College for her basics and then transfer to UNT to further her studies. JOSE ZUNIGA is the son of Johnny and Gina Zuniga. He has participated in Cross Country, Track, Basketball, Tennis, Robotics, FFA President, 4-H, UIL Academics, One-Act Play, Ag. Mechanics, Livestock Judging, Showing Animals. Jose plans to attain Weatherford College to get his basics, and then transfer to Permian Basin to major in Petroleum Engineering.